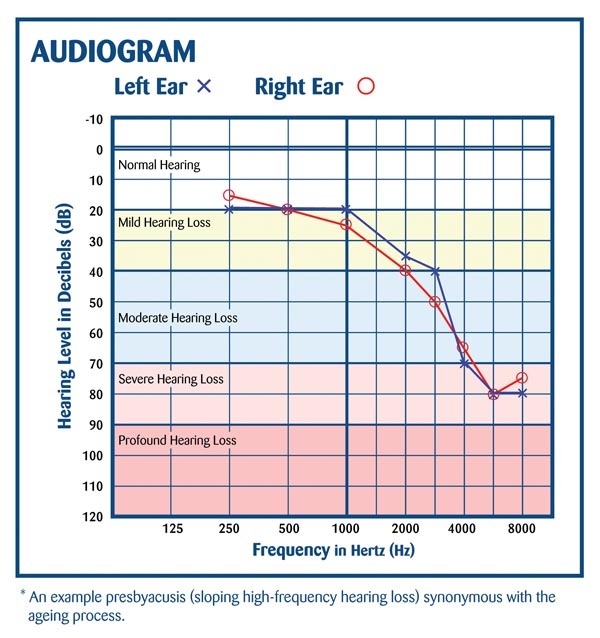 The results of a hearing test are recorded on a chart called an audiogram. An audiogram is a graph with red O’s and blue X’s connected with little lines. The O’s represent the right ear and the X’s indicate the left. 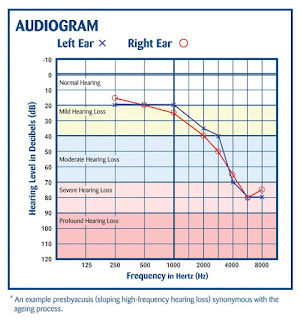 Marks near the top of the graph are an indication of better hearing while marks further down the graph denote worse hearing. Located across the top or bottom of the audiogram are frequency numbers ranging from 125 Hz, a very low tone, to 8000 Hz, a very high tone. Along the side the graph a series of decibel (dB) numbers indicate loudness. Very soft sounds are at the top (-10 or 0 dB) and loud sounds (110 db) are located at the bottom. Zero dB does not mean that there is no sound. This level is merely the softest sound a person with normal hearing ability can perceive 50% of the time. A normal conversation usually occurs at about 55 dB on the decibel scale.